SAN LUIS OBISPO, Calif. — (April 30, 2017) — On a sunny, beautiful Central Coast Sunday morning at the 6th SLO Marathon, Sergio Reyes, 35, from Palmdale, Calif. and Kelsey Lakowske, 24, Davis, Calif. won the 26.2 mile races in 2 hours, 21 minutes, 42 seconds and 2:59:08, respectively; Reyes also shattered the event record. 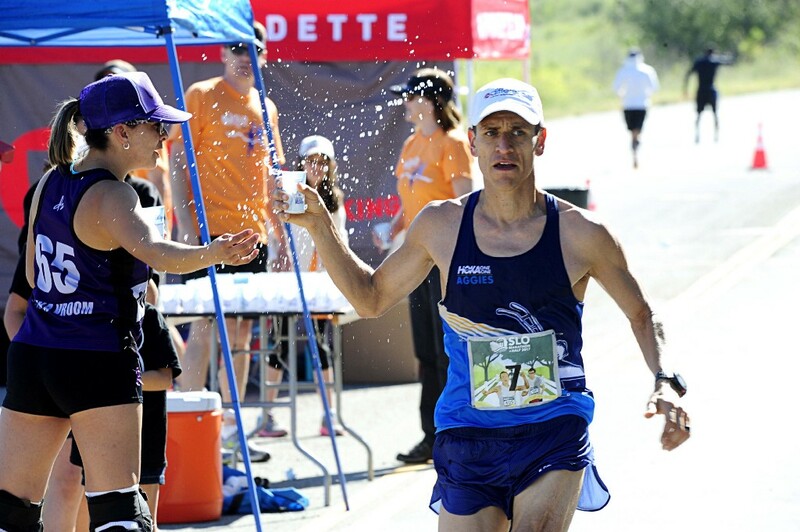 In the SLO Half Marathon, both champions, Ben Bruce, 34, Flagstaff, Ariz. and Jenny Kadavy, 34, Clayton, Calif. crushed the previous event records in 1:09:21 and 1:20:20, respectively. In the men’s Marathon, Reyes, who grew up in San Luis Obispo, was the star of the field as he led from start-to-finish with an event record shattering 2:21:42. Timothy Comay of Walnut Creek, Calif. was runner-up in 2:42:57. The 2012 inaugural Marathon champion and top Master Van McCarty, 46, of San Luis Obispo again finished third, clocking 2:46:37. “This course is pretty tough and the day was warming up, but towards the end of the race, I was motivated to run faster than Jordan Hasay’s 2:23:00 debut marathon at Boston,” said a smiling Reyes, who took home $850 in prize money ($600 for the win plus a $250 event record bonus). In the women’s 26.2 mile race, Lakowske, who entered as a non-elite, also went unchallenged to the tape in 2:59:08, a 6:50 per mile pace. Christie Clemons of San Luis Obispo was second in 3:25:36 followed by Kristin Edler of Arroyo Grande in third (3:32:37). 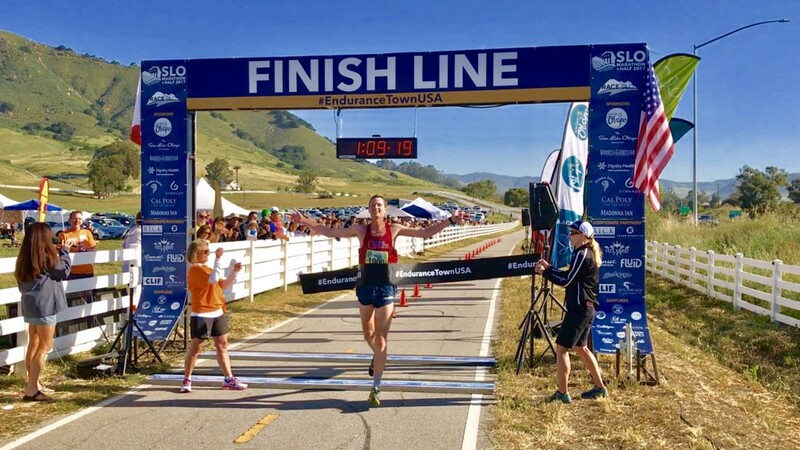 “My mom qualified for the Boston Marathon and I entered to try to qualify for Boston too so that we can run it together,” said a surprised Lakowske, a San Luis Obispo native, who also finished 6th overall in her road marathon debut and qualified for Boston. In the men’s Half Marathon, Bruce and defending champion Joe Thorne of Grover Beach were the front runners from the gun with Thorne leading to 10 miles before Bruce caught him and pulled away for the win in 1:09:21 to Thorne’s runner-up 1:09:45, both under the previous event record by Thorne. The 2016 runner-up Brandon Messerly of San Luis Obispo finished third, recording 1:11:25. In the women’s 13.1 mile race, Kadavy also established an event record with her unchallenged 1:20:20. Master Molly Friel, 49, of Fresno was runner-up in 1:25:09 and Erin Tracht of San Luis Obispo took third again, this time in 1:26:37. “I felt really good at first, but the hills hurt a bit. The crowd was amazing and so supportive,” stated Kadavy, a HOKA ONE ONE Aggies Running Club member and 2016 U.S. Olympic Marathon Trials qualifier. San Luis Obispo Mayor Heidi Harmon, in her debut half-marathon, finished in 3:53:05. There was also an open-to-the-public 2-day event festival full of activities for the whole family including free runner’s yoga powered by lululemon, Ninja Warrior Legacy course, gymnastics, live music by B and The Hive and Box the Oxford plus BBQ by RibLine, beers by Lagunitas Brewing Co. and numerous vendors. More than 3,800 participated in the weekend festivities and the Marathon and Half Marathon. The 7th SLO Marathon + Half and 5K will be held April 28–29, 2018 and a new race has been added to the event family: 4-person Marathon Relay. Early Bird registration for the 2018 event is open until May 7 at https://raceroster.com/events/2018/12784/2018-san-luis-obispo-marathon-half-marathon-marathon-relay-5k-kids-races. The Marathon is $75, the Half Marathon $50 and Marathon Relay $280, Early Bird. Established in 2008 to bring world class sporting events to the beautiful California Central Coast, the Race SLO 2017 event line-up includes the 6th SLO Marathon + Half and 5K (Spring 2017), the NEW Healthy Running Sports Medicine Conference (Spring 2017), SLO Ultra trail races & NEW Mountain Bike Race at Wild Cherry Canyon (Fall 2017) and SLO GranFondo cycling & VIP event (Fall 2017). The Race SLO Team organizes and produces both fun & competitive running and cycling events that create a positive impact on both our participants and local communities. Come experience the best the California Central Coast has to offer: year-round sunshine, rolling green hills, unspoiled open roads, first class finish lines and more. 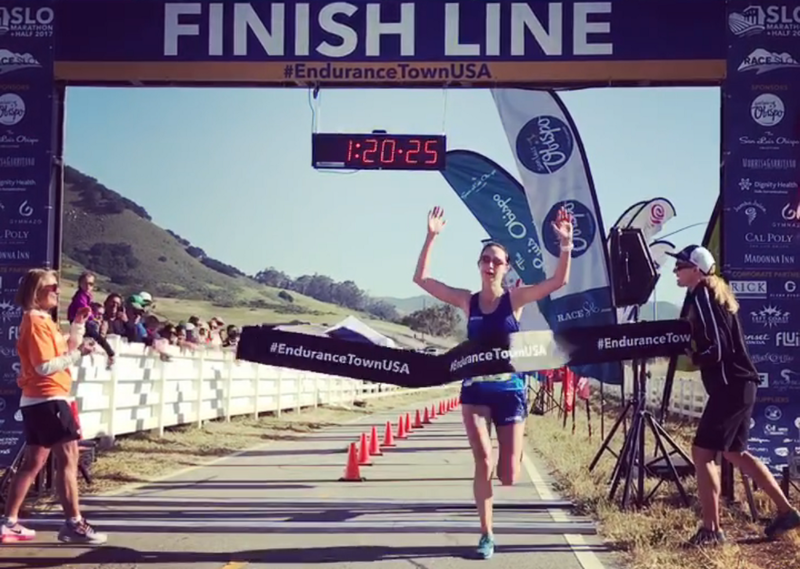 Come Race SLO: #EnduranceTownUSA! Visit RaceSLO.com for more information.